Clockwise from top left: Photo courtesy of Radius; photo courtesy of Body by Simone; photo courtesy of Booya Fitness; photo courtesy of Barre3. Sometimes you'd rather be exploring a new city than schlepping to a new gym. Good thing keeping up your fitness regime while traveling the world gets easier and easier: Your favorite trainers and boutique fitness studios are increasingly online, streaming classes to your phone, tablet, and laptop, making it super easy to sweat and tone wherever you are. (Well, maybe not the middle of the crowded piazza.) We rounded up a few of our favorite boutique fitness subscriptions to help you maintain a fit and healthy lifestyle anywhere with a solid WiFi connection. Maintain access to the coveted fitness studio with a weekly, one-hour workout video filmed with Anderson in real-time during one of her classes. 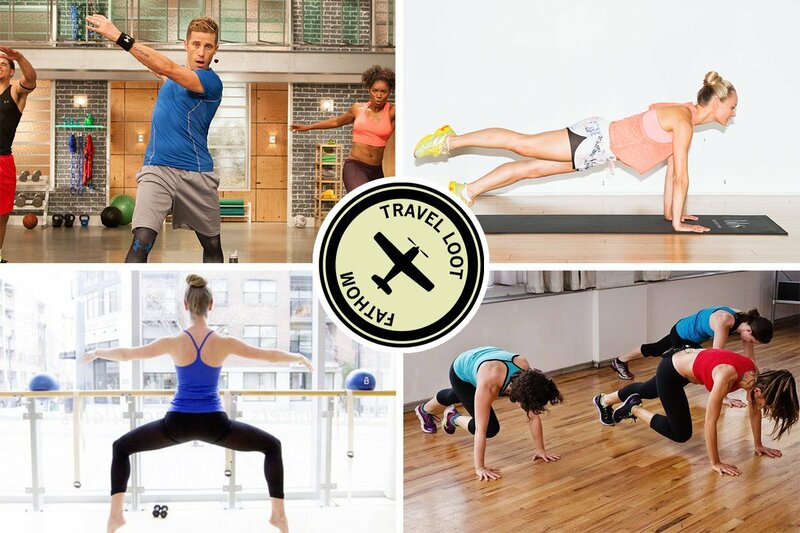 Make the most of your time with high-intensity, on-demand classes from top boutique fitness brands like Brooklyn Bridge Boot Camp, SoHo Strength Lab, and ReXist360. Best part: Classes range from 15-45 minutes, which leaves plenty of time to explore your new surroundings. Ensure a low-impact, total body workout with moves inspired by ballet, yoga, and Pilates. Videos come in increments of 10, 30, 40, and 60 minutes. Nix the ohms and chants towards enlightenment in favor of a sweat-inducing, convenient daily yoga practice that costs less than a single class. The modern day Jane Fonda has made it easy to sweat and tone anywhere in the world. Short video segments means you can string together a full body workout or target specific muscle groups. Pack a personal trainer with the on-demand video platform that streams to your smartphone, tablet, or laptop. There's a wide range of fitness levels and workouts, including beginner bootcamp, cardiosculpt, and yoga.